Talos has discovered an unknown Remote Administration Tool that we believe has been in use for over 3 years. 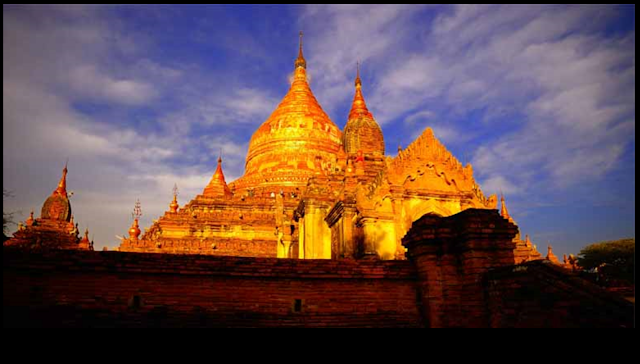 During this time it has managed to avoid scrutiny by the security community. The current version of the malware allows the operator to steal files, keystrokes, perform screenshots, and execute arbitrary code on the infected host. Talos has named this malware KONNI. This evolution is illustrated across 4 campaigns: one in 2014, one in 2016 and finally two in 2017. The decoy document of the 2 last campaigns suggests that the targets are public organisations. 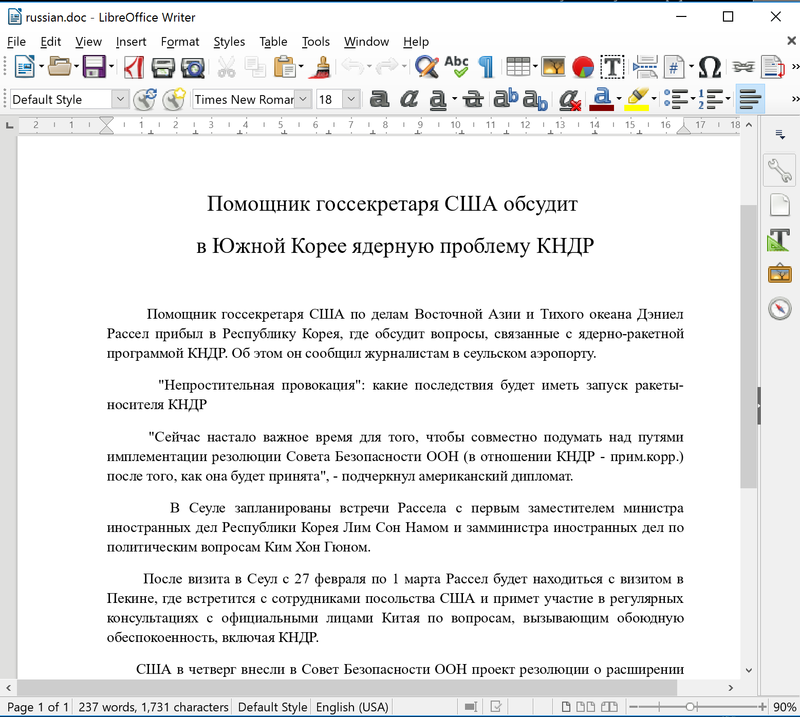 Both documents contained email addresses, phone numbers and contacts of members of official organizations such as United Nations, UNICEF, and Embassies linked to North Korea. The developer used the Microsoft Winsocks API to handle the network connection. Surprisingly, this isn't the easiest or the most efficient technical choice for HTTP connection. 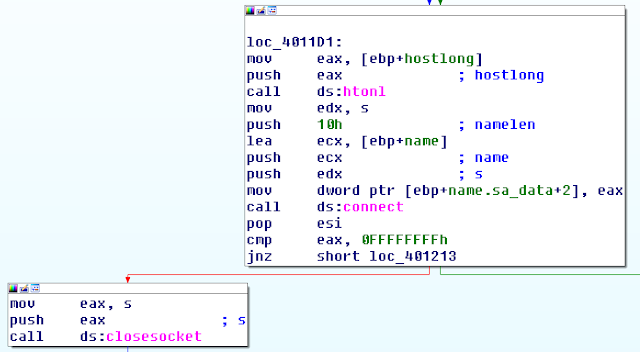 The malware samples we analysed connected to only one URI: <c2-domain>/login.php. 2016 Campaign: "How can North Korean hydrogen bomb wipe out Manhattan.scr"
The name of the .scr file was directly linked to tension between North Korea and USA in March 2016: more information. Based on the compilation dates of the binaries, the campaign took place in the same period. An interesting fact: the dropped library was compiled in 2014 and appears in our telemetry in August 2015. Indicating that this library was probably used in another campaign. 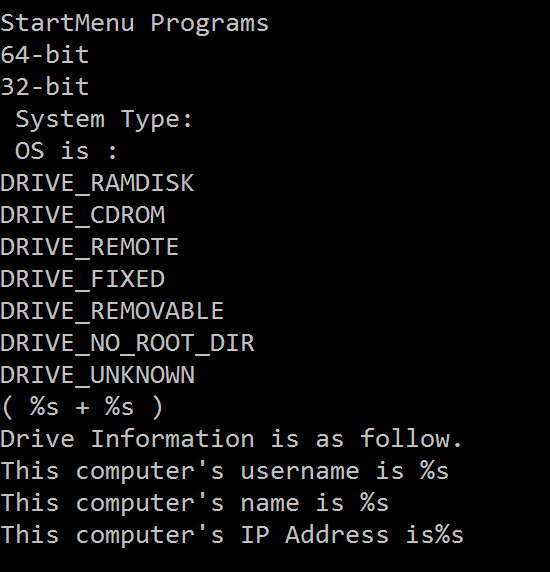 Another difference is the directory where the files are dropped, it's no longer C:\Windows but rather the local setting of the current user (%USERPROFILE%\Local Settings\winnit\winnit.exe). Thanks to this modification, the malware can be executed with a non-administrator account. The .dll file is executed by the .exe file. In this version, a shortcut is created in order to launch winnit.exe in the following path %USERPROFILE%\Start Menu\Programs\Startup\Anti virus service.lnk. 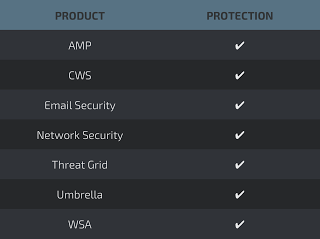 As you can see the attacker has went to great lengths to disguise his service as a legitimate Antivirus Service by using the name 'Anti virus service.lnk'. This is of course simple but often it can be enough for a user to miss something malicious by name. This version includes the stealer features mentioned in the previous version and additionally Remote Administration Tool features such as file uploading/download and arbitrary command execution. The library is only used to perform keylogging and clipboard stealing. Indeed, the malware author moved this part of the code from the core of the malware to a library. An interesting element is that the malware looks for filenames created with the previous version of KONNI. This implies that the malware targeted the same people as the previous version and they are designed to work together. 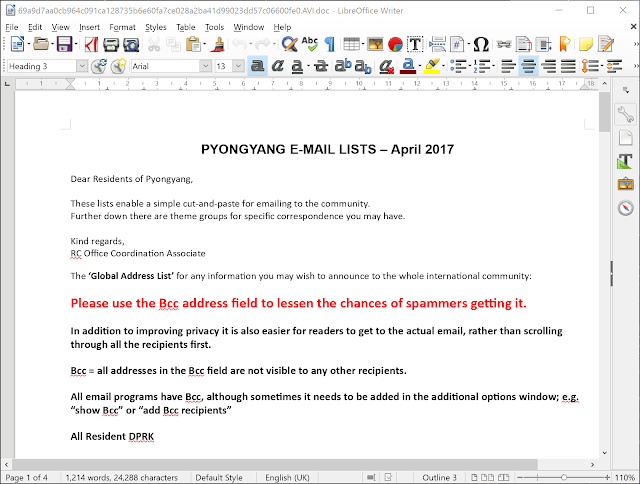 In this campaign, the malware author uses the following name: Pyongyang Directory Group email April 2017 RC_Office_Coordination_Associate.scr. The decoy document shown after infection is an Office document containing email addresses, phone numbers and contacts of members of official organizations such as the United Nations, UNICEF, Embassies linked to North Korea. This document contains the name, phone number and email address of members of agencies, embassies and organizations linked to North Korea. The analysis shows us the evolution of KONNI over the last 3 years. The last campaign was started a few days ago and is still active. The infrastructure remains up and running at the time of this post. The RAT has remained under the radar for multiple years. An explanation could be the fact that the campaign was very limited nature, which does not arouse suspicion. 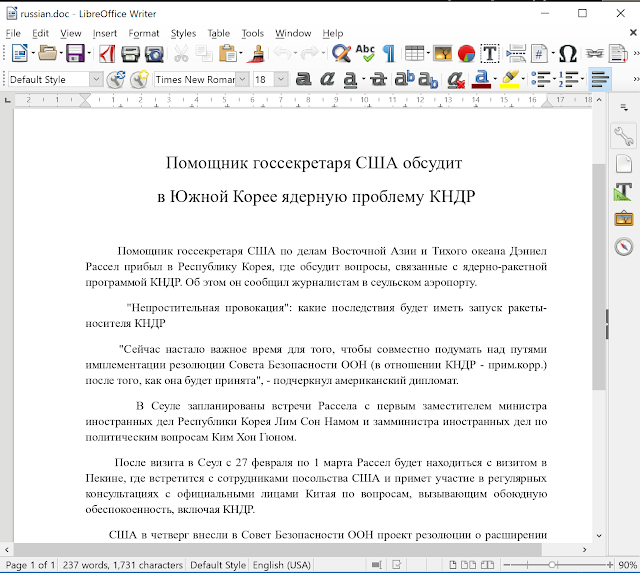 This investigation shows that the author has evolved technically (by implementing new features) and in the quality of the decoy documents. The campaign of April 2017 used pertinent documents containing potentially sensitive data. 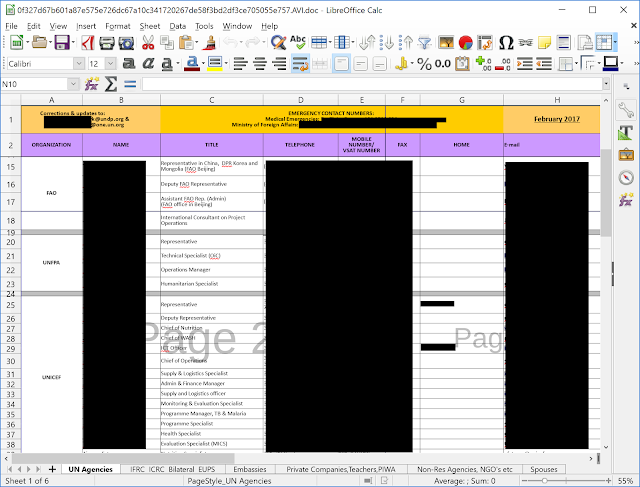 Moreover the metadata of the Office document contains the names of people who seems to work for a public organization. We don't know if the document is a legitimate compromised document or a fake that the attacker has created in an effort to be credible. 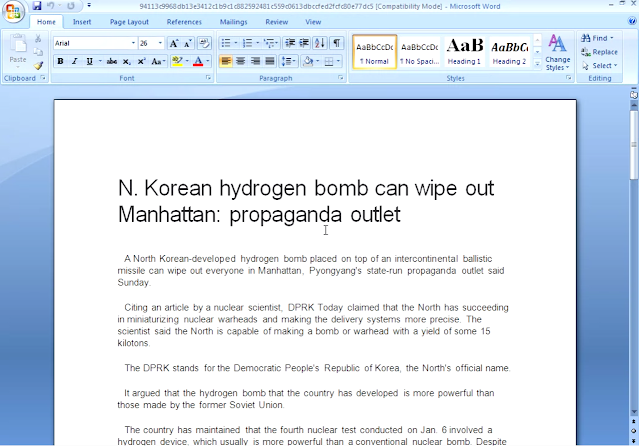 Clearly the author has a real interest in North Korea, with 3 of the 4 campaigns are linked to North Korea.